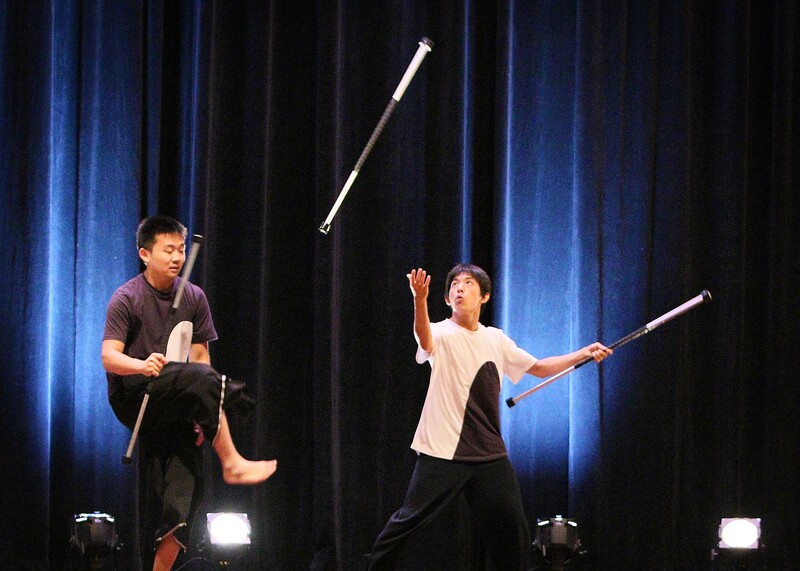 The 71st Annual IJA Festival convened at the Mass Mutual Center and nearby Symphony Hall in Springfield, Massachusetts July 16-22, 2018. Jugglers enjoyed the environs of this Art Deco city on a river in the Boston area. Special Guests included Michael Moschen, Wes Peden and Florence Huet. Moschen returned to his hometown for the event. Many other guest performers attended from around the U.S. and internationally. 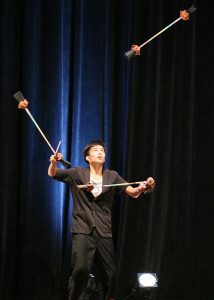 The convention center, performance venue, and downtown vicinity got good reviews from visiting jugglers. The Mass Mutual convention center located downtown was devoted to the festival. 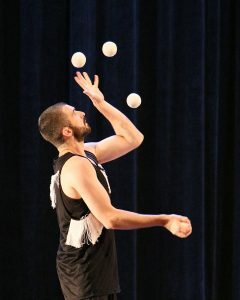 One of the first events offered, X-Juggling took place with a necessarily high ceiling. 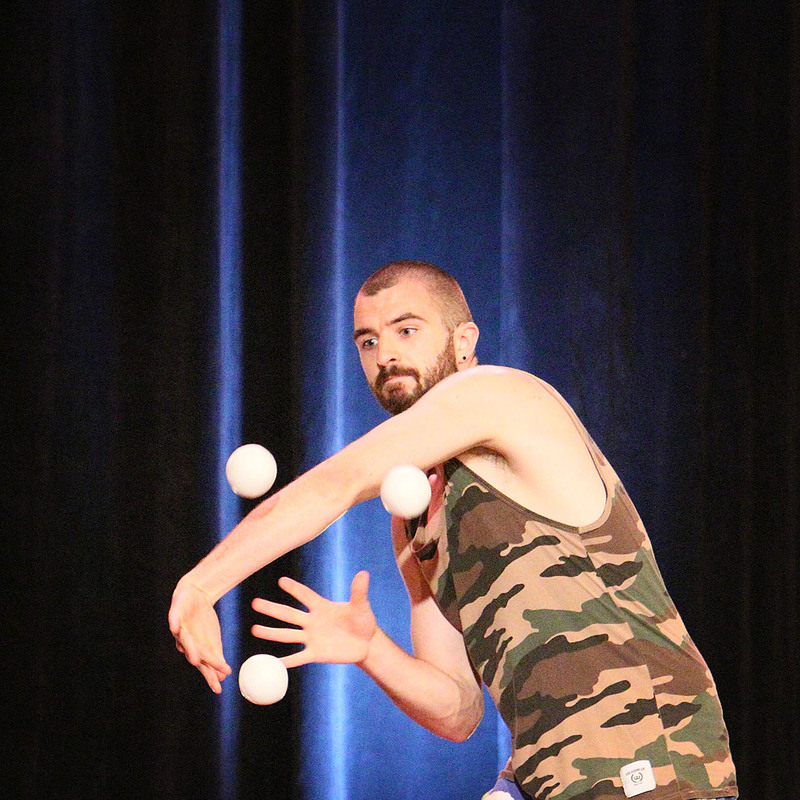 Kyle Johnson demonstrated a head balance into a six-ball site swap pattern. Wes Peden contributed many moves including a back-of-head catch to seven, and five-high 360 with seven, and six-ball columns with a four-high 360. A trio performed with 15 rings and box juggler Liam Halstead accomplished several “out of the box” variations from his repertoire. 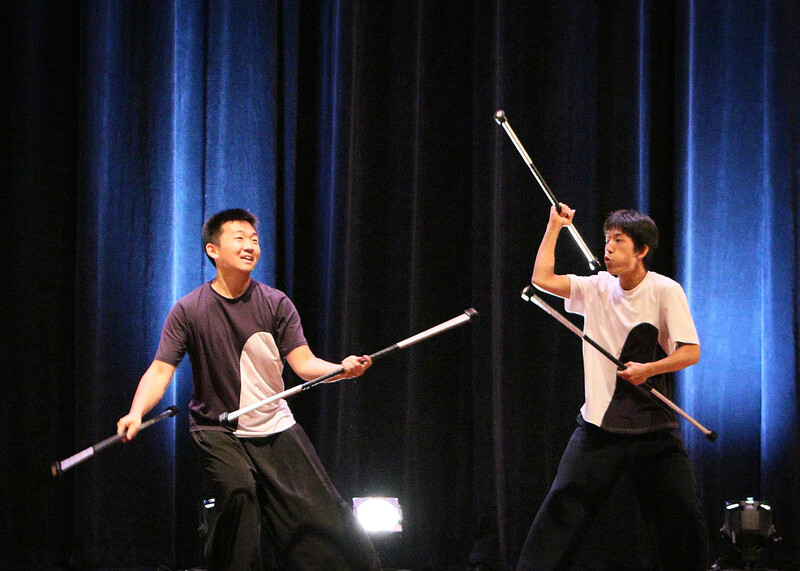 The Welcome Show, an additional variety show at the start of the week, has become an IJA tradition. This year Ross Berenson of the New York jugglers directed the show. 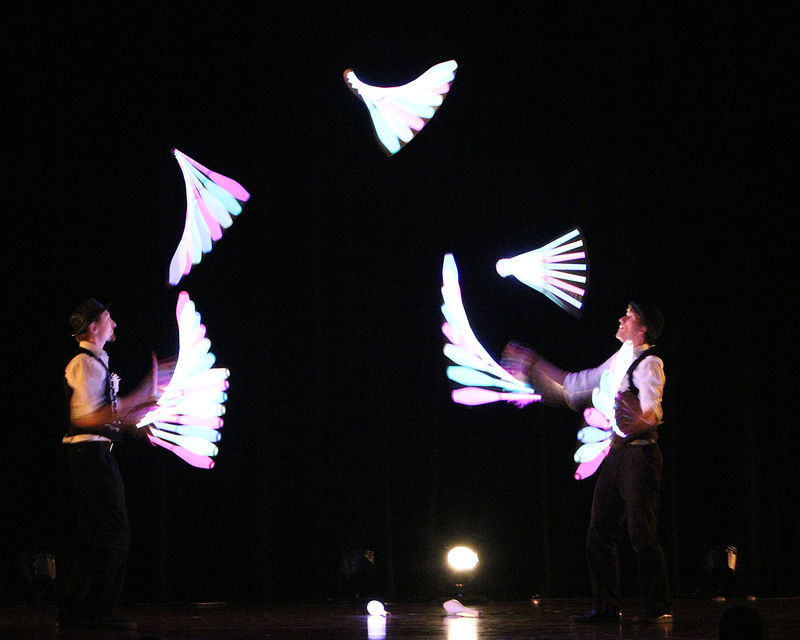 The duo Fly by Night served as hosts with their edgy comedy and juggling antics. Kathryn Carr seemed a natural in the vaudeville style. 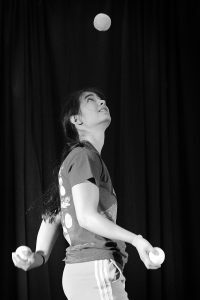 Juggling up to five hats in various combinations, including rolls and trades, she integrated the flow of her choreography with her tricks and appealing character. 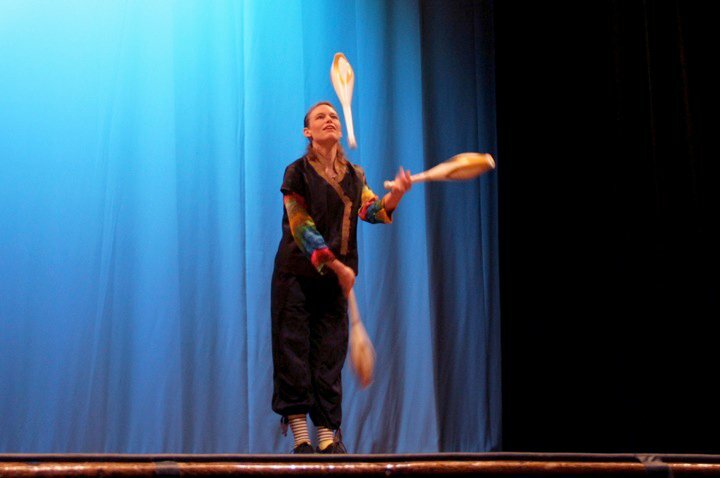 She works professionally from the Baltimore area and has performed and taught workshops at many festivals, as she did in Springfield. 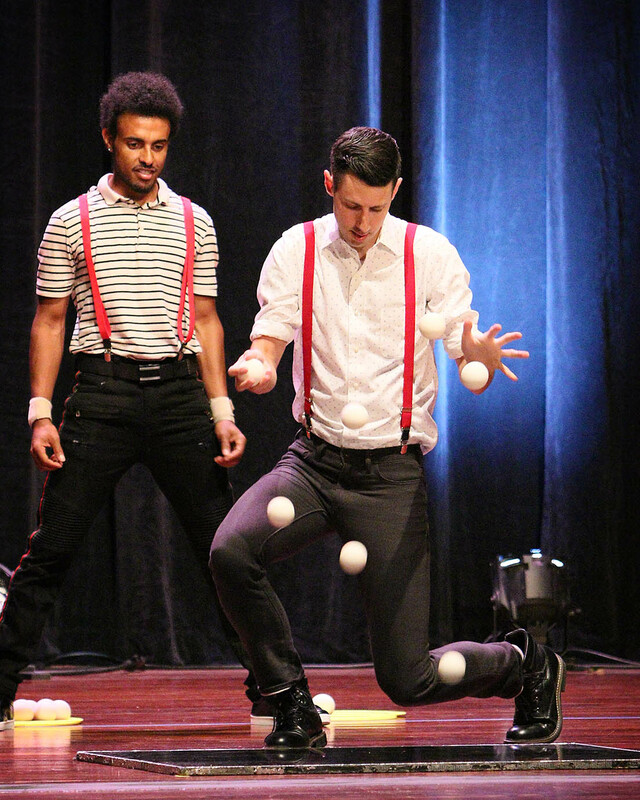 Salih Mohammed teamed with Christian Kloc in an inspired ball-bouncing duo to cook up an entertaining blend of high-tech performance and skill. Foot bounces with crossing balls, five-ball pattern changes, and an acro stand with eight balls paired difficulty with fun. 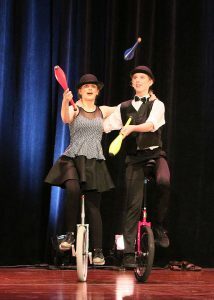 The routine also included a seven-ball bounce and a force-bounce on unicycle. 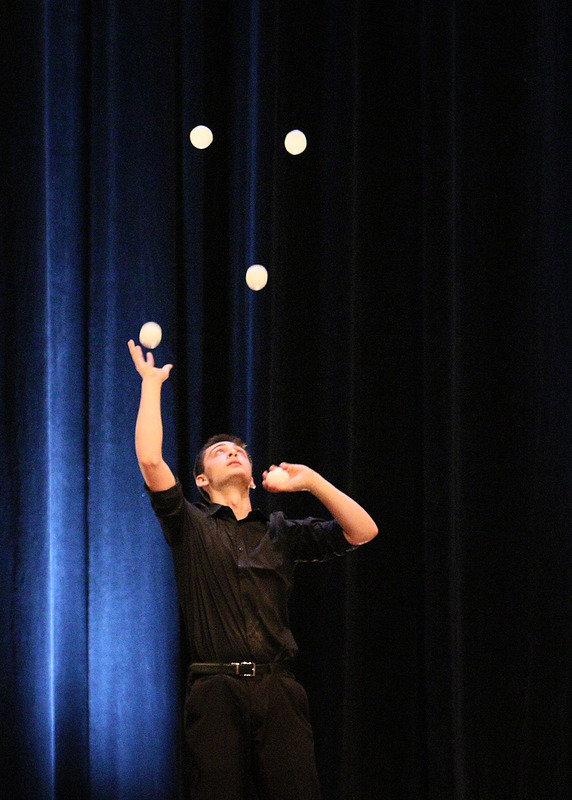 Christian Kloc, also a journalist and chef, is known for the ideas he brings to juggling. He met Mohammed, from Ethiopia, in the Maryland/DC area. Salih Mohammed has toured Europe with Mother Africa and Circus Ferrel. He has also worked a cruise ship and was part of Cirque Dreams in the USA from 2011-2015. Kloc recalled “coordinating an act that would showcase each of our strengths as well as tricks that we could learn to perform together… it was fun trying to match his energy on stage, as well as work with someone who’s an experienced acrobat.” Kloc also won the Individual Ball Bouncing gold medal in the Numbers Championship with a nine-ball run. 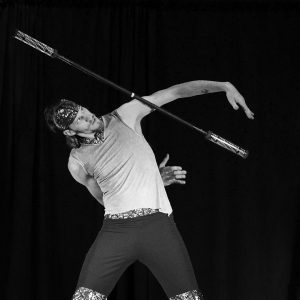 Ben Domask performed a character dance with peacock feather and balances. 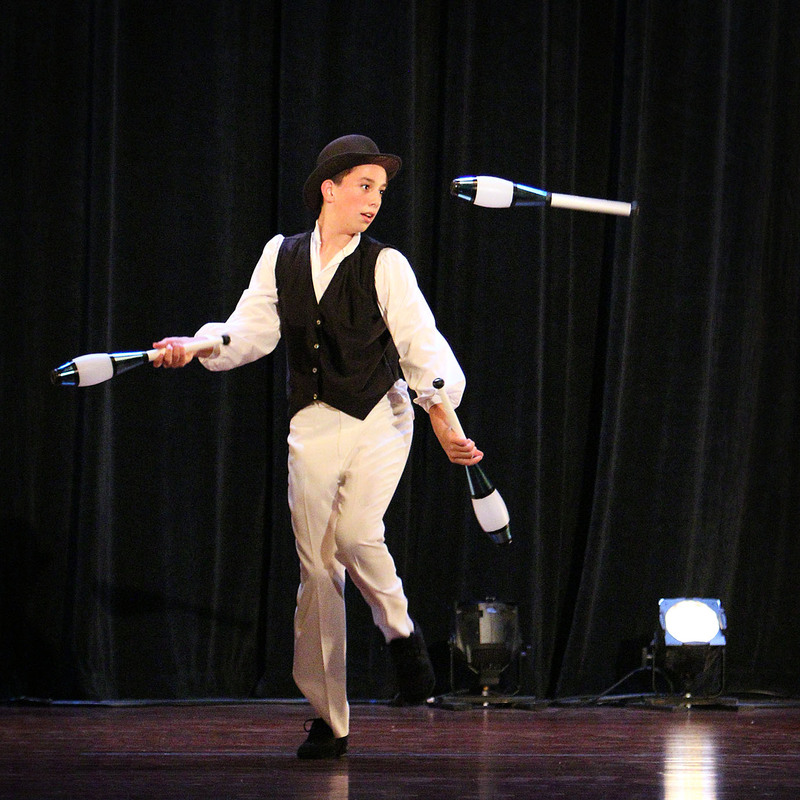 A pirouette to a foot balance led from the whimsical to the dramatic in his juggling. 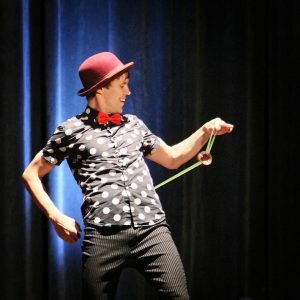 In another act that added variety to juggling, Justin Weber performed off-string yo-yo. 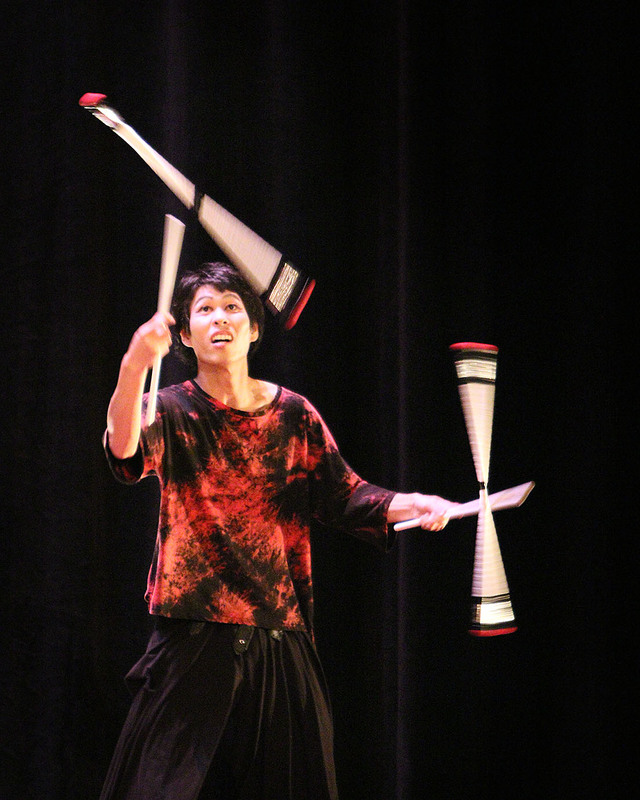 His charismatic performance coaxed the most out of this prop, the spin creating windows with the string. 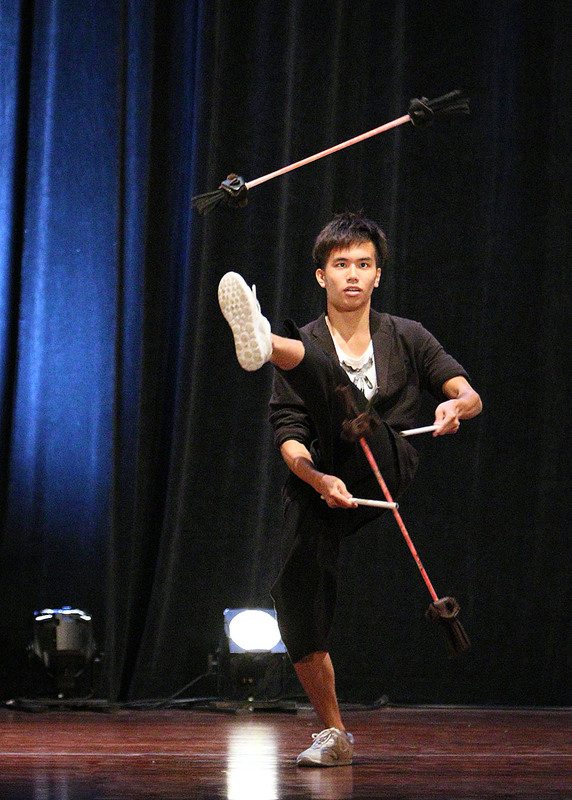 In a classical flow arts piece, Alexandre Pich of France performed twin hoops impressively. The floating physics of the routine seemed almost hypnotic as the isolated rotations and side-by-side vertical variations created a methodical atmosphere. Pich hopes to play more variety theaters. Francis Gadbois, a regular at Turbo Fest, began as a character reading in a library set. Soon pages from his book took on life. He worked with three and four cigar boxes, using varied catches and shapes. 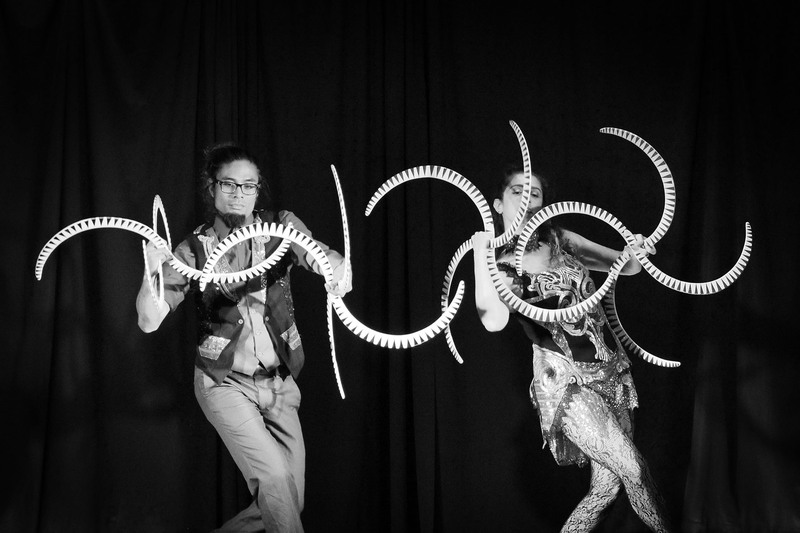 Continuing theater of the absurd, Fly by Night performed whip cracking illusions with a courageous volunteer. 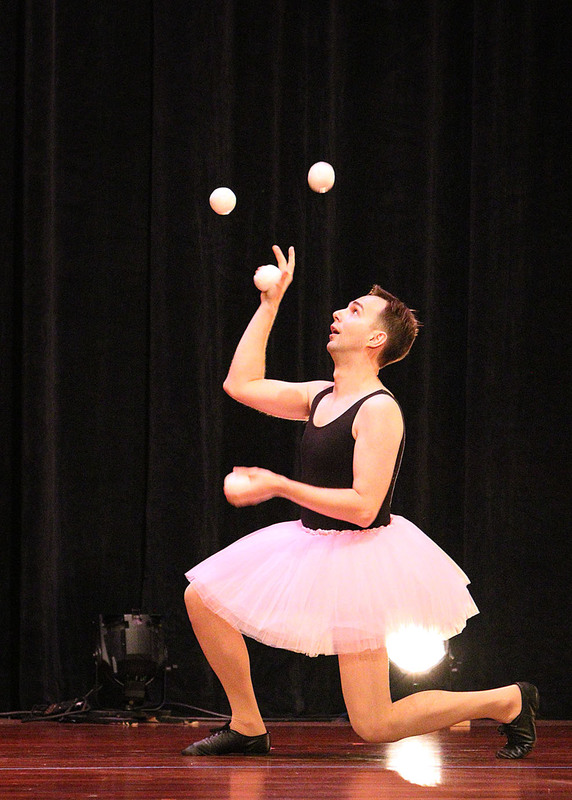 Appearing as a hip hop artist en tutu, Michael Karas wove three and four-ball tricks to the spirit of the music. 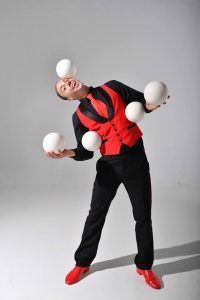 His experience as a juggler and entertainer emerged with tricks and parodies. The 2006 IJA Bronze Medalist, he also won the Individual Prop and Bix Beiderbecke Champ. 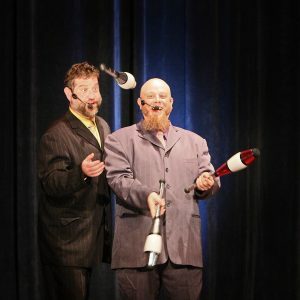 Karas has toured nationally with the trio Playing by Air. Recently they performed at New York’s Symphony Space. International juggler Florence Huet danced through and around multiple hula hoops, creating hoop mandalas, on and off body to juggling five hoops. A chiming soundtrack kept pace with the crescendo of climbs and manipulations leading to a balancing finale. Huet attended the Regional Center of Circus Arts in Lomme, France, and the Kyiv Municipal Academy of Circus and Variety Arts, Ukraine. 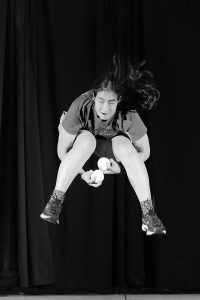 She has toured with Compagnie Jerome Thomas since 2015 and brings her inimitable style to her juggling compositions. In a tropical themed act, Wes Peden juggled everything including the scenery. His world class technique with balls and clubs played out with creativity and humor. Mandala moves and overhead juggling with dance turns led into five-ball combinations. 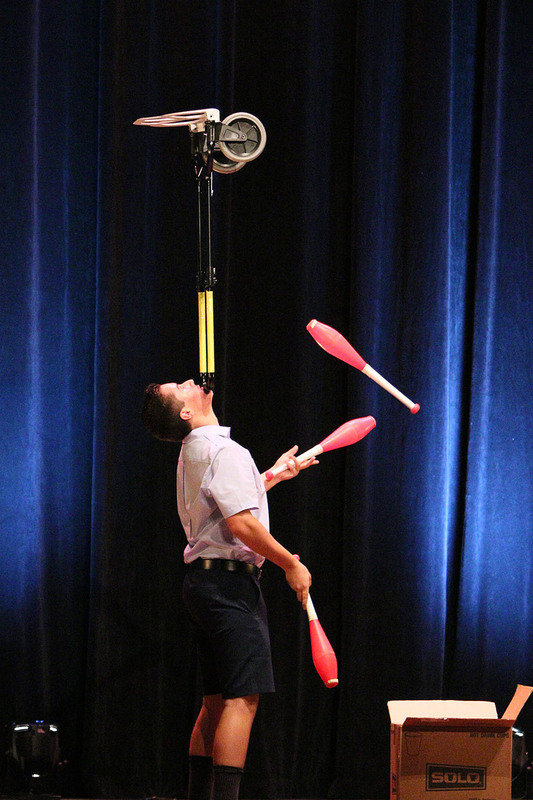 Ball and club juggling included 6-object columns. 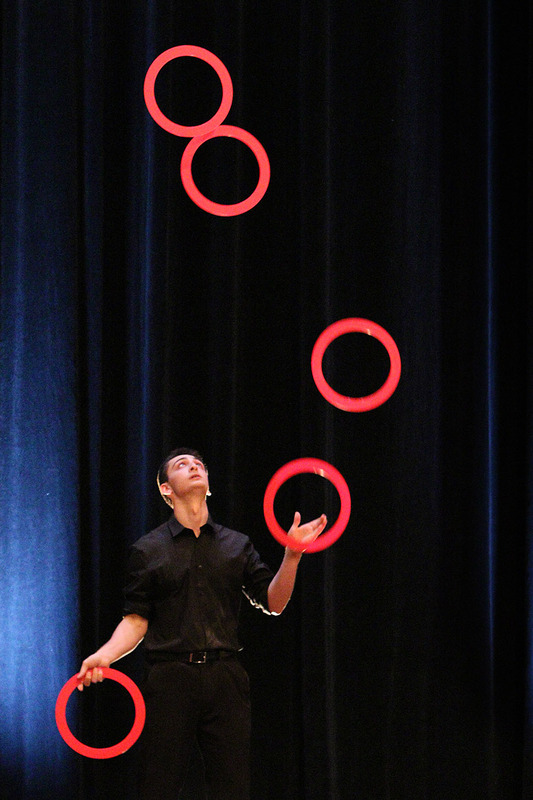 Juggling rings of various sizes was an impressive highlight. Balancing variations and back crosses moved smoothly to the music as if to slow down the time. 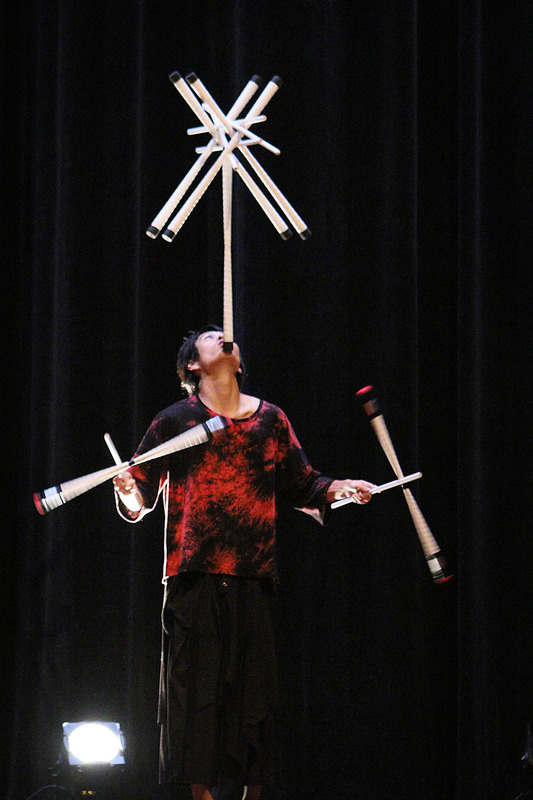 From three-high 360s to original variations, Wes kept pace with his characteristic sense of gravitational magic. Five-club reverse throws and circular patterns led to a seven-club finale. The Youth Showcase, also at Symphony Hall, featured a variety of solo and team acts with Martin Hiti and Peter Holmquist as hosts. 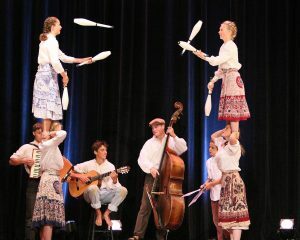 The Hudson Jugglers, a large multi-age ensemble, performed a sweet act on the joys of life with clubs, balls, and musical instruments. Basket balls and balancing came into play. 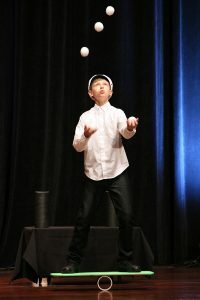 In an entertaining solo, Kai Heartlife showed proficiency with four balls, including Mills Mess and a circular pattern. A five-ball run on one knee to a neck catch with Mongo monkey music made a nice finale. Josie Dambeck juggled five white beanbags in a black dress and Nicolas Marshall performed rola bola to the song, Yellow Submarine. 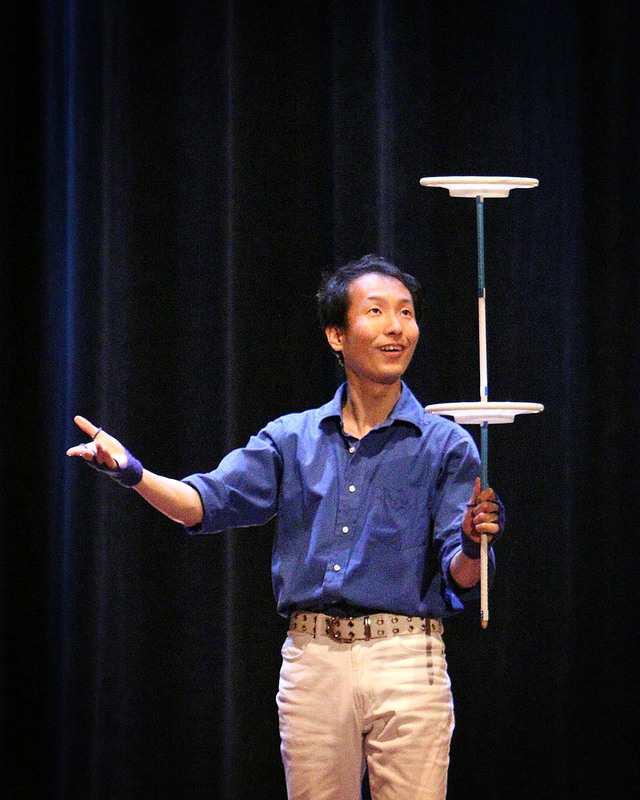 Janice Chao, the New Jersey State Diabolo teen champion, demonstrated her expertise with a variety of turning moves. Phoenix and Austin performed a travel spoof with luggage, interceptions and machete passing. 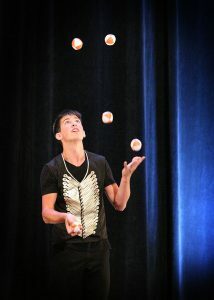 Cody Dawson, 17, of the Edina Jugheads, performed a moonwalk with rings. Finger spins “around the world” and five-ball columns took technical achievement. The Merry Misfits, a Diabolo duo On the Road to Belfast, performed side-by-side and synchronized variations, six-club take-aways and trades. 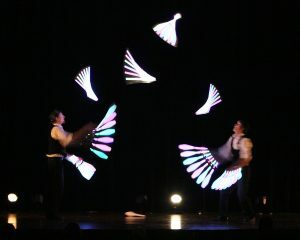 They also performed with the Hudson Family Jugglers. 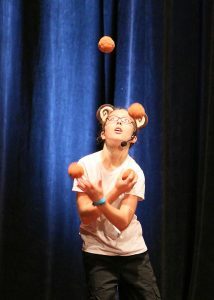 LilyRuth Mamary and Scott Raison juggled six and eight balls with swing-style clown choreography. A six-ring color change while passing and a unicycle combination trick added delightfully for the audience. They are coached by Richard Kennison of Circadium in Philadelphia. 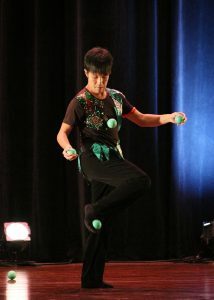 The solo of Matthieu Chatelaine included four and five-ball variations. As the final act, Miranda Miller’s style built as she developed an individual rapport with the audience. 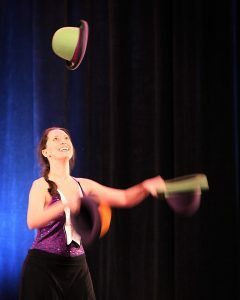 She performed site swaps, body throws, and acrobatic juggling. 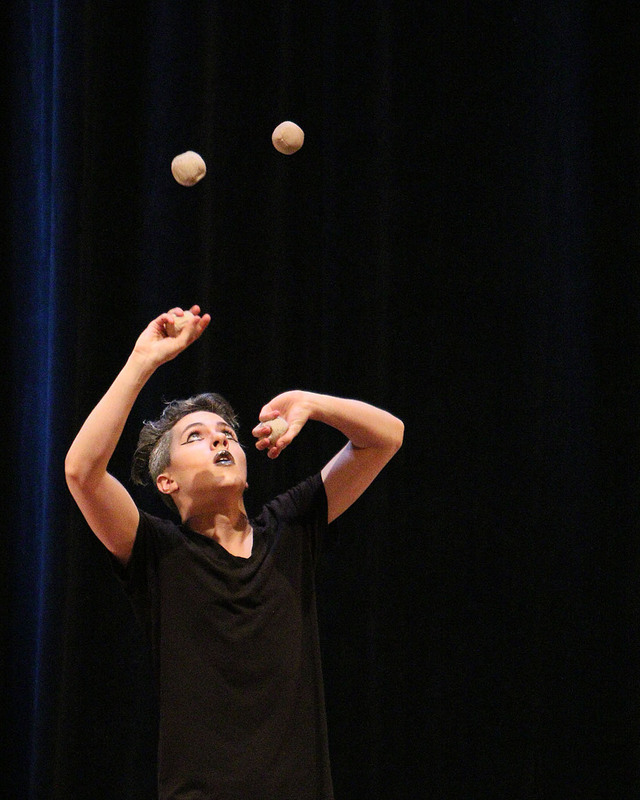 The Juniors Competition, introduced by theater artist Michael Trautman, continued to showcase some of skills on the frontier of juggling. A pioneer of New Vaudeville, Trautman has performed at festivals and performing art centers such as Just for Laughs in Montreal and The Kennedy Center in Washington, D. C. in addition to The Statler Brothers Show on TV. He also toured nationally with OOPS! 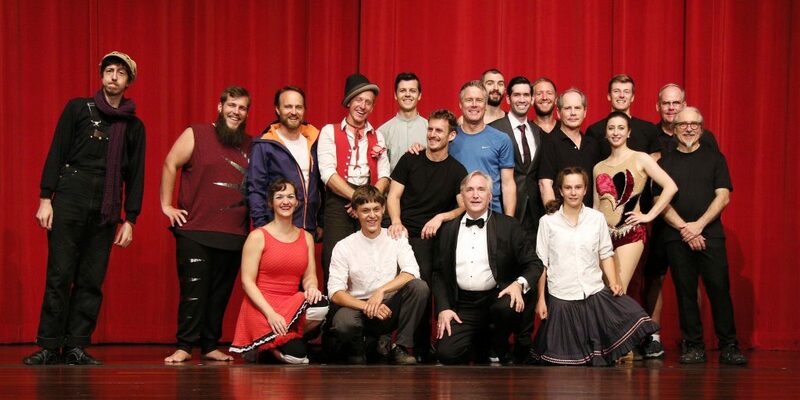 The Big Apple Circus Stage Show and worked as Artistic Director at the Maine Circus Academy. As MC of the Juniors he performed with hats, ping pong balls, and acts of physical comedy. Kyle Albrecht began with four rings to the music Going to the Other Side. To add to the intrigue he used LED clubs. Three and four, and five ball columns and site swaps, enlivened the Greatest Show music. It all built to a seven-ball finish. Ethan Brain staged a juggler’s poignant if raucous dinner party. 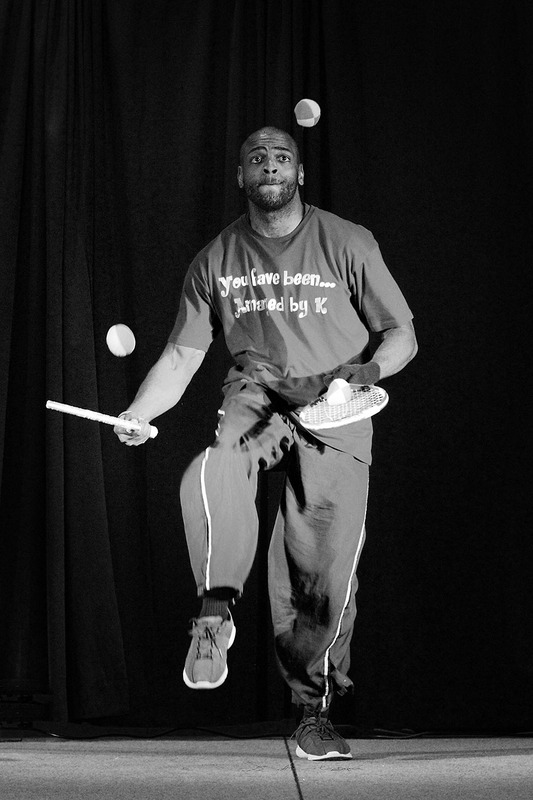 Juggling to My Heart is a Ghost Town with four and five ball variations, he grooved on to six ball patterns and a dramatic three club routine. 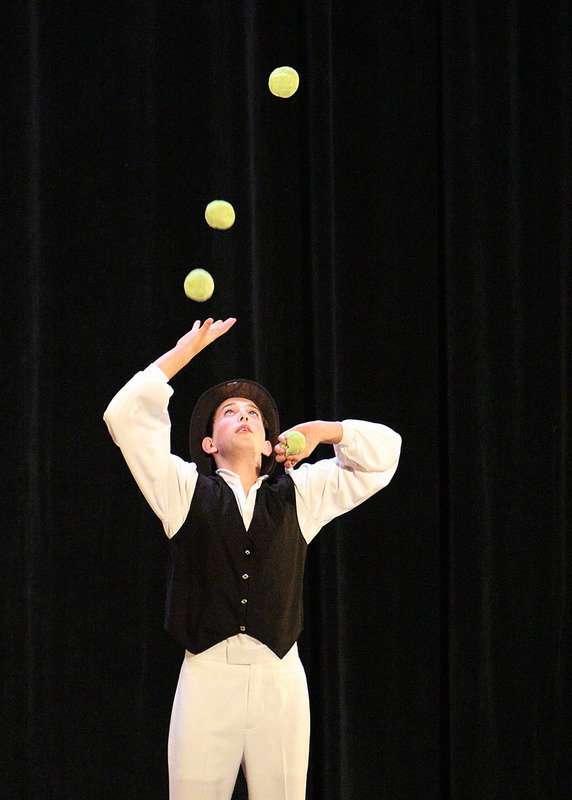 He also juggled seven balls, always tossing props in the spirit of the act. For a comedic interlude Michael Trautman performed his hilarious slapstick act with ping pong balls. Christopher Haaser’s act combined technical juggling and showmanship. Five-ball 360s, seven balls, and five rings flowed smoothly to the music. 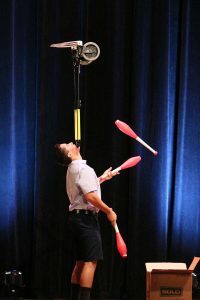 A five-club three-high 360 and an attempt at a five-high showed he has continued to progress as a juggler to watch in competitions and events. Christopher Haaser won the Bronze Medal. Grant Bishop evoked more of the vaudeville era in his work with up to five and six rings. Four beanbags overhead and three-high into a five-ball column pattern to a site swap maneuver added difficulty as did seven balls. Musical accents highlighted a kick-up to propeller throws. Four and five clubs, including a three-high 360, and three clubs continued the musical theme. Grant Bishop won the Silver Medal. Continuing the variety with perhaps something that has never been done before, Sho Kasuya entered the competition with contemporary flower stick artistry. Again the music and tricks united with the musical score. A reverse cascade with three flower sticks and a three-high 360 were some of the variations seldom seen. Juggling four flower sticks seemed to equal some of the higher numbers accomplished at the event. Sho Kasuya won the Gold Medal and a trophy. Viveca Gardiner presented the IJA’s Award for Education to Jacob Alex Dyer. 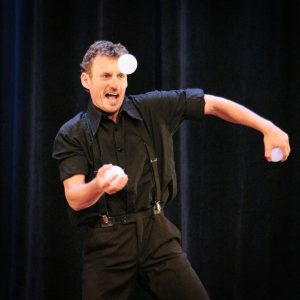 Alex, as he is known, was recognized for his work in teaching juggling to the public with the New York Jugglers at Bryant Park in Lower Manhattan. 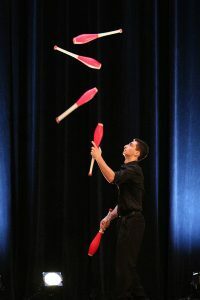 What began as a lunch break diversion has become a staple of New York life for tourists and “regulars,” potential recruits to the Carmine Street Irregulars juggling club in Greenwich Village. Kentaro Tsuchiya returned to IJA Individuals competition with a styled juggling and footbag act. His dexterity with five beanbags and foot catches goes with an original costume. Cascading with his hands and feet, including a neck catch to his foot in attitude, he brought a fun and energy and novelty to the competition. His foot tosses into five-ball patterns led into seven with multiplex to a foot catch pirouette finish. Jonah Botvinick-Greenhouse, a former Juniors champion, performed one of the more difficult routines in IJA competition. His musicianship was evident in the way the juggling flowed to the string and piano music. He began with five rings using many patterns including a three-high from five with bounce into the pattern and flips in a half shower into flats. He had a strong run with seven balls into a five-high 360. 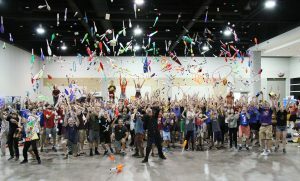 The difficulty continued with four and five clubs including a five-high 360 into singles, a five-high 180, and five clubs into flats to singles with 360s. He also had a long seven-club run. Jonah won the Silver Medal in the Individuals and later received the People’s Choice Award. In a first-time performance at the IJA, Masayuki Furuya also performed a skillful and entertaining act. 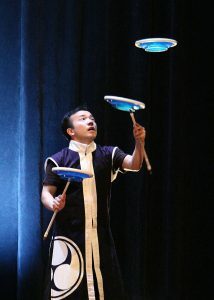 Specializing in plate-spinning with various cross-handed catches and balances such as plate-on-plate body moves, he brought a joyful energy to the competition that carried him to a gold medal. 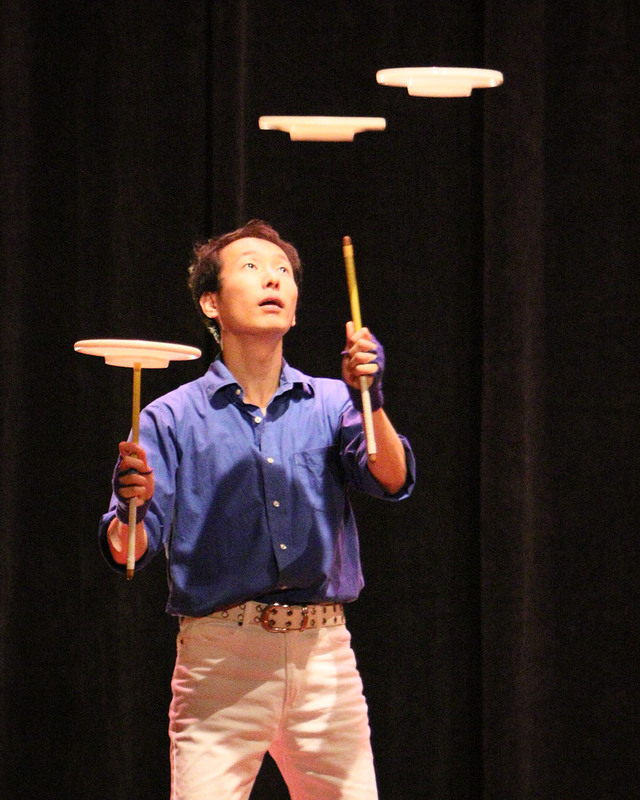 He juggled three sticks under plate spin tosses and juggled three plates in a cascade pattern off the sticks. His innovative tricks also won the Anything Goes event in the X-Juggling earlier in the week. 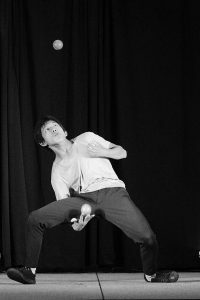 He said of his entrée to plate spinning: “Basically I was a usual juggler like balls and diabolos but after practicing a couple of years… it would be an advantage for my skills.” He plans to enter a plate spinning competition at the Japan Juggling Festival (JJF) in Tokyo. 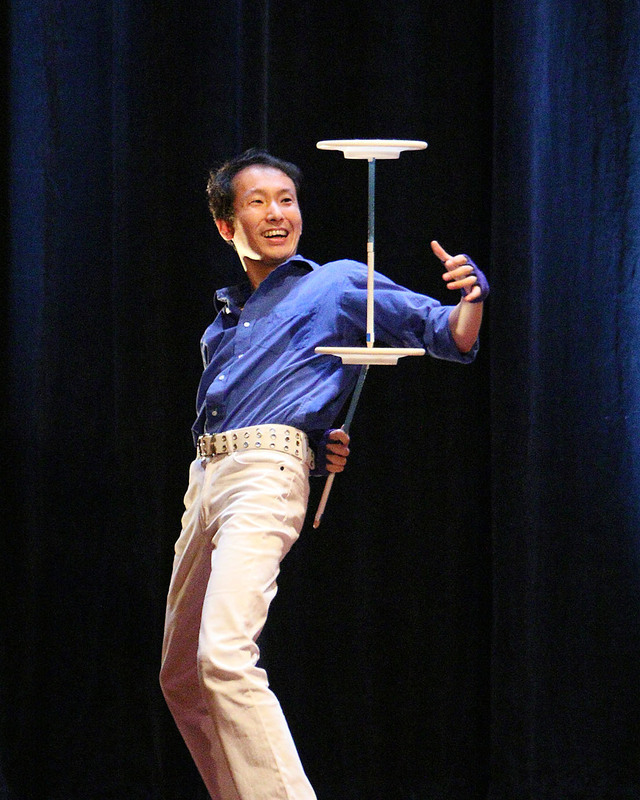 Makoto Hanada was another plate spinner from Japan, and his act earned him a Bronze medal. Using multiple devil sticks, Aki Ueno created fast-moving tableaus. Like the plate-spinners, Ueno built to crescendos structuring the routine with only a few props and stage presence. 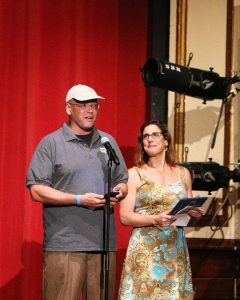 With Joe Showers as MC, the Team and Individual acts alternated on the program. Joshua Nelson and Issac Cantor performed as a duo. 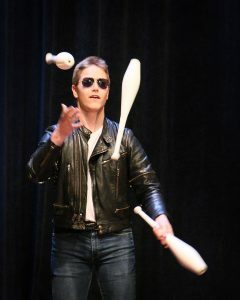 Trading five clubs and ball bounce patterns, they shared up to eight balls with a 50s style theme. They passed seven and juggled five rings in a shoulder stand. 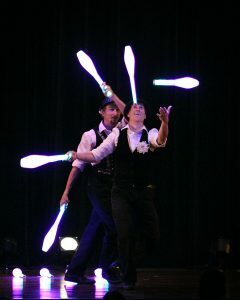 In an artistic highlight of the team competition, KK Staff, Takumi Oskar and Keiichiro Kato, performed a choreographed staff twirling act. “We were really happy to act on the the very nice stage and were so happy to see all the audience giving us the powerful response,” Takumi said. KK Staff won the Silver Medal. 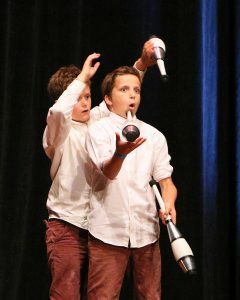 The Cosmic Cousins, Eli March and Scramble James, won the Gold Medal with an LED club juggling act. The mix of props, styles and age groups in the Teams gave it variety, and Cosmic Cousins used their ensemble moves and skill to bring about the best in their club juggling. They also won six-club distance passing in the Games. The IJA’s Award of Excellence went to Mario Berousek. 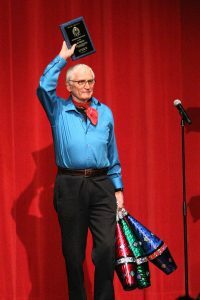 In presenting the award, historian and JUGGLE editor Alan Howard recalled Berousek’s early beginnings as a seventh-generation Czech circus performer. 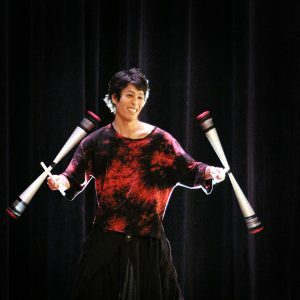 His fast and fabulous repertoire includes five-club variations and choreography. 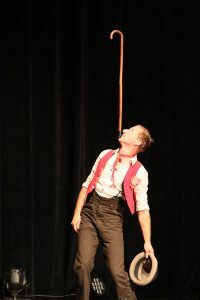 Berousek, in action at Circus Nemo in Denmark, sent a video acceptance speech. “I’m very proud to be part of such great company,” he said of winning the award. “In juggling you want to reach. 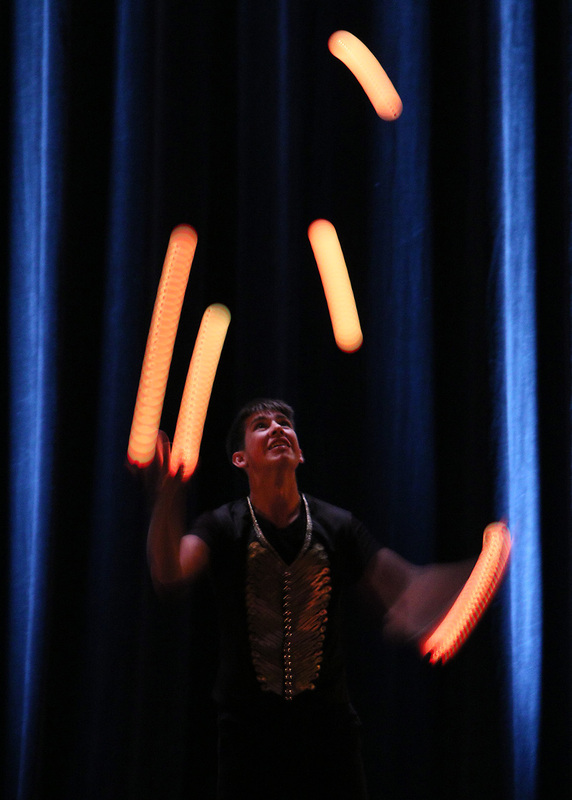 Juggling must go on…” and then he juggled five clubs. 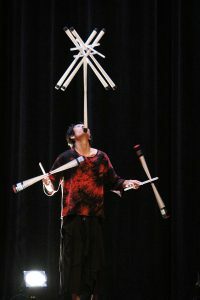 Mario Berousek’s career highlights include performances at the Tigerpalast Variete Theater in Frankfurt, Cirque D’Hiver Bouglione, and Circus Knie. 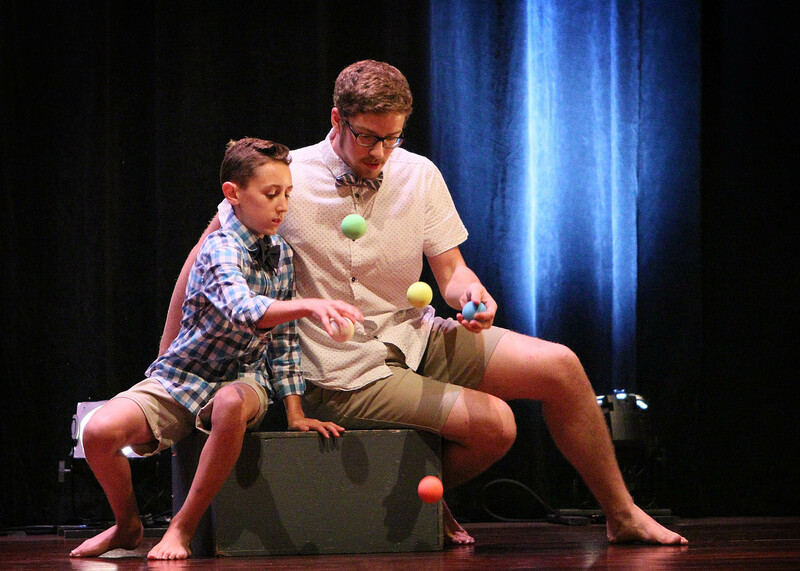 As an added opportunity for creativity and skill, the festival included a Flow Arts Show put together by Kevin Axtell and hosted by the winning team act. 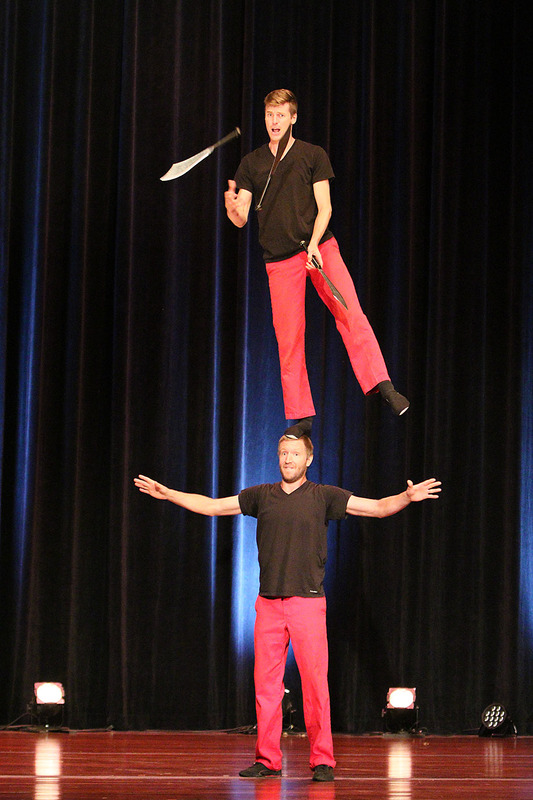 Team Champions Eli March and Scramble James performed runaround patterns with trading hat and color-changing staffs. Noel Yee and Lauren Raske performed an S Curves montage. 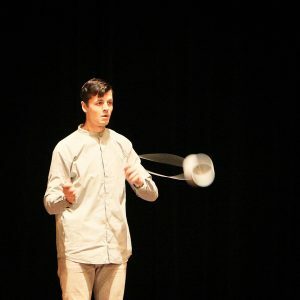 Matt Hall spun diabolo with off-string and double-string moves, sometimes using horizontal play. He added a trick from the workshop of Guillaume Karpowicz. 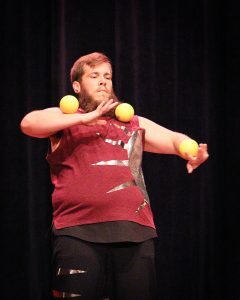 Earlier this year Matt Hall has performed and organized the Game of Throws juggling festival, planned again Jan. 25-27, 2019. In Springfield, he also organized the Individual Prop Contest initiated by Dan Holzman. 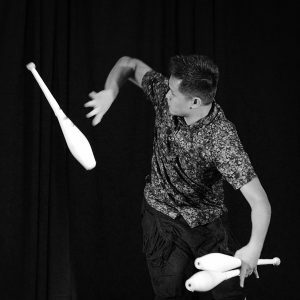 Marvin Ong of Manipu–elation, a juggling and flow arts festival scheduled to repeat in October this year, flourished and circled three clubs as he is known for. In Springfield, he offered a workshop in Juggling. All things Flow, Fluid, and French. 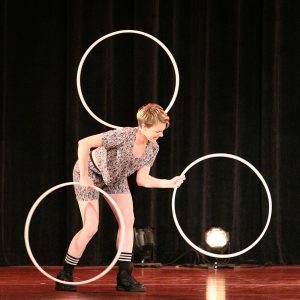 Cassaundra Smyth of Akron, OH performed three mini hoops using some moves derived from vaudevillian bicycle hoop rolling. 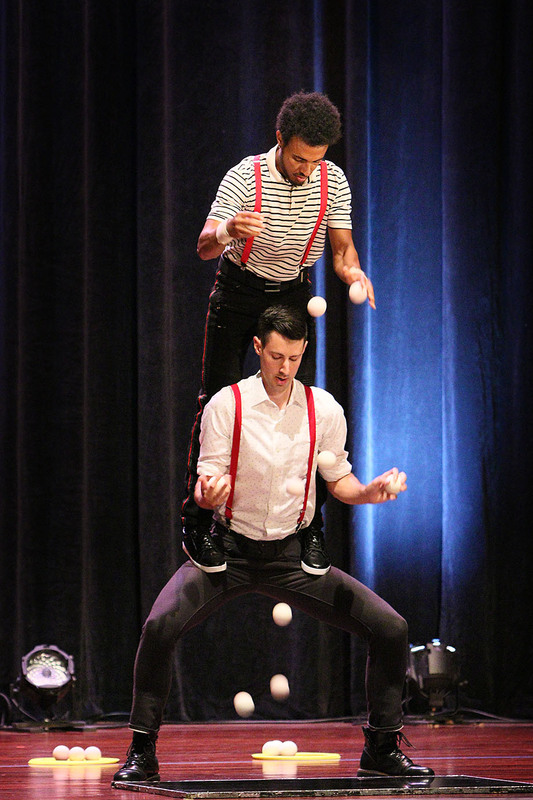 A three-ball poem on the gravitational limits of time as it relates to juggling added a touch of philosophy to the program as did the duo of team champions, Jugglology. Kyle Johnson rolled a gold stage ball around his arms in a routine that built to a strong finish. 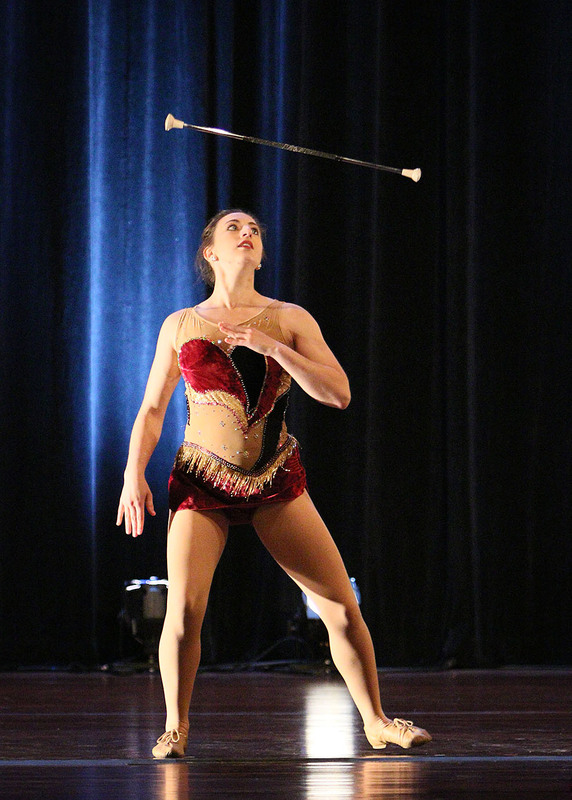 Courtney Cormier’s intriguing juggling and baton work were also performed in the Cascade of Stars. 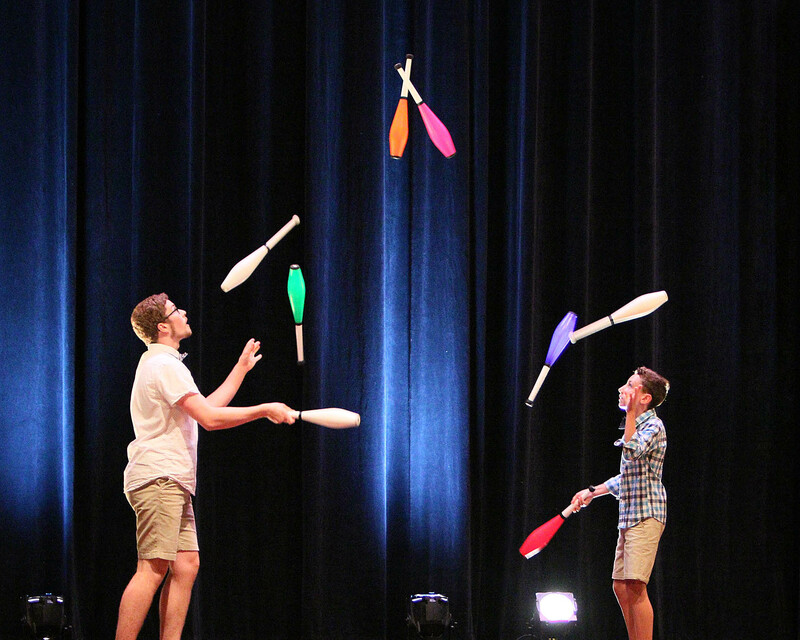 For jugglers wishing to learn new techniques, Dave Pawson and Sophia Noethe organized a plethora of Workshops throughout the festival. 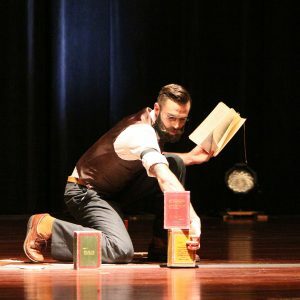 From Don Lewis’ Basic Club Tricks to Erik Aberg’s History of Clubs (the objects, not the meetings) and Cigar Boxes there was something for everyone. Matt Hall taught four and five club multiplex and tips passed on by Luke Wilson. 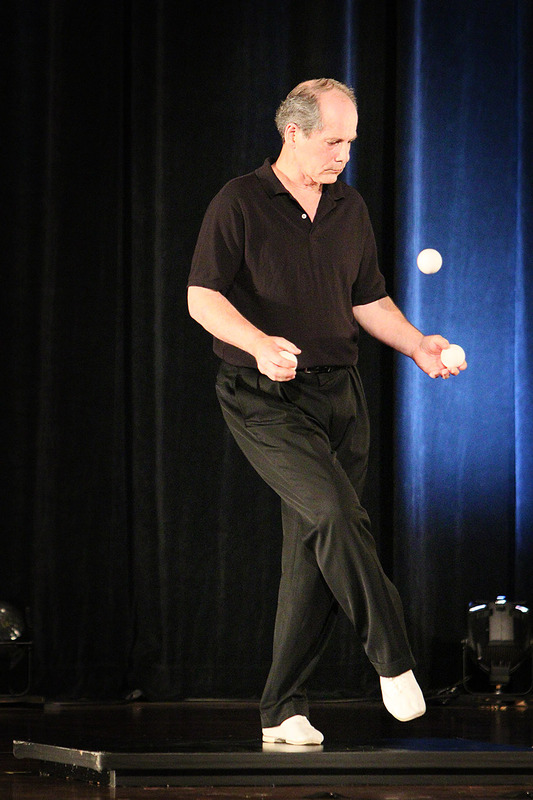 Alexandre Pich taught Antispin Theory with Batons and Hoops, Remi Lasvenes explained the Psychology of Magic, and Justin Weber taught Yo-Yo means “Come Back.” Robert Peck taught A Visual Feast: The Beauty of 3 Ball Juggling. He performed juggling, comedy and high-wire for many years with Linda Peck, who also attended the festival. Toward future festivals and events, the IJA welcomed new board members elected in Springfield. With Chair Exuro Piechocki, the new board included Eric Shibuya, Ian Michael Loughlin, Yuki Ueda, Matan Presberg, Mike Moore, and Sophia Noethe. Erin Stephens, the Regional Competitions Director, introduced a sponsorship program to help jugglers with new work. 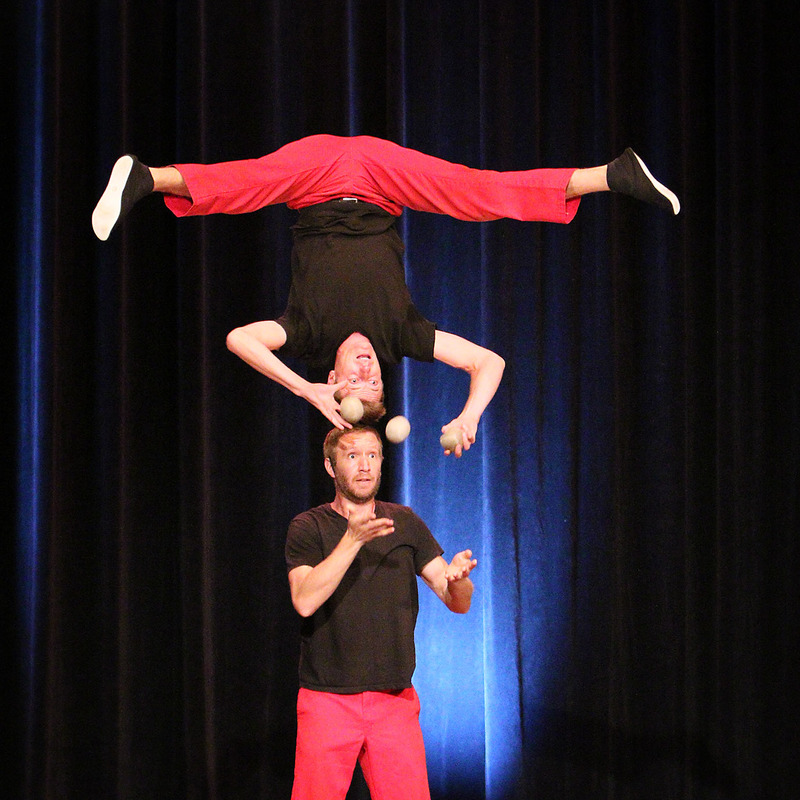 The Red Trouser Show, an acro comedy duo, began the Cascade of Stars. 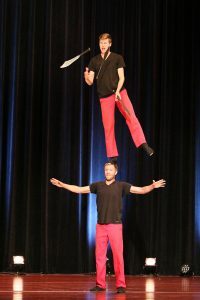 With long distance hat tosses and a funny shoulder stand rotating on one foot with dagger juggling, the duo performed a straddle balance with juggling. 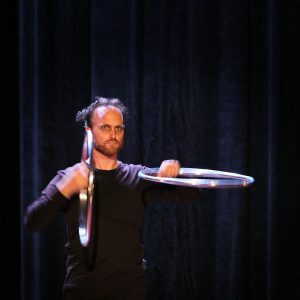 Alexandre Pich of Nantes, France, whose work with its own atmosphere and ideas, performed with silver hoops and sticks. 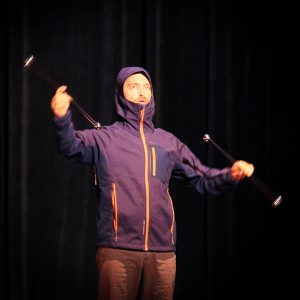 Manipulating sticks to a dramatic soundtrack, he drew the audience in. 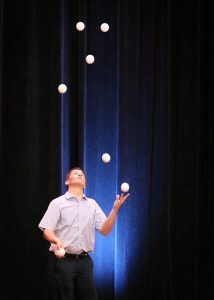 Kyle Johnson performed to the song Diamonds in your Eyes Tonight with three ball contact and juggling. 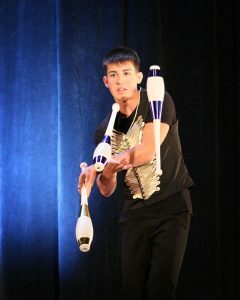 His routine has great pacing and integration of dynamic toss and rolling tricks. 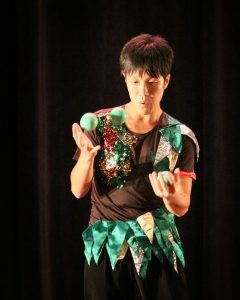 He also won the three-ball event in X-Juggling. Kyle plans to attend festivals in Maine and the Pacific Northwest. 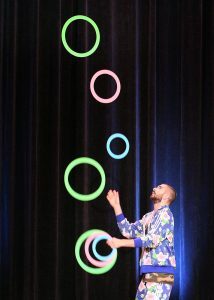 Originally from California, he is based in Michigan and will perform at the SpinFest in Australia. 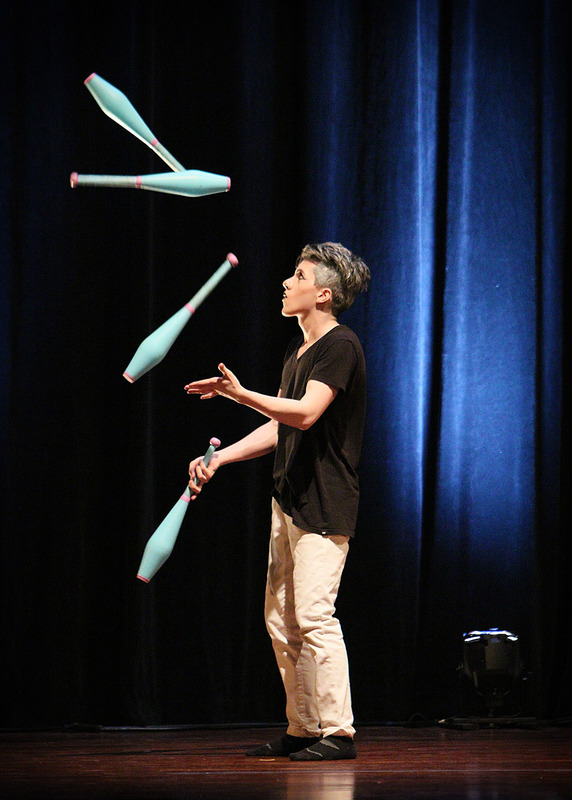 He invites jugglers to his tutorials on Instagram @juggleforyou. 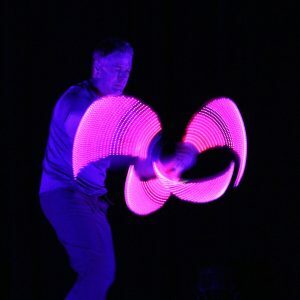 Mark Nizer, the 1990 Individuals champion, performed with C-curve LEDs. Known for his career with cruise ships, nightclubs, and colleges, Nizer’s solo show now plays theaters and performing arts centers. Justin Therrien of Bellingham, WA, performed in collaboration with kids playing accordion and violin. He added vaudevillian moves including mime scarf and floating hat, tossing the hat to a cane balance. Cate the Great Flaherty performed acrobatically with perpendicular rola bolas with two different axes of balances and ingratiating performance personality. She also won the handstand endurance contest in the Games. 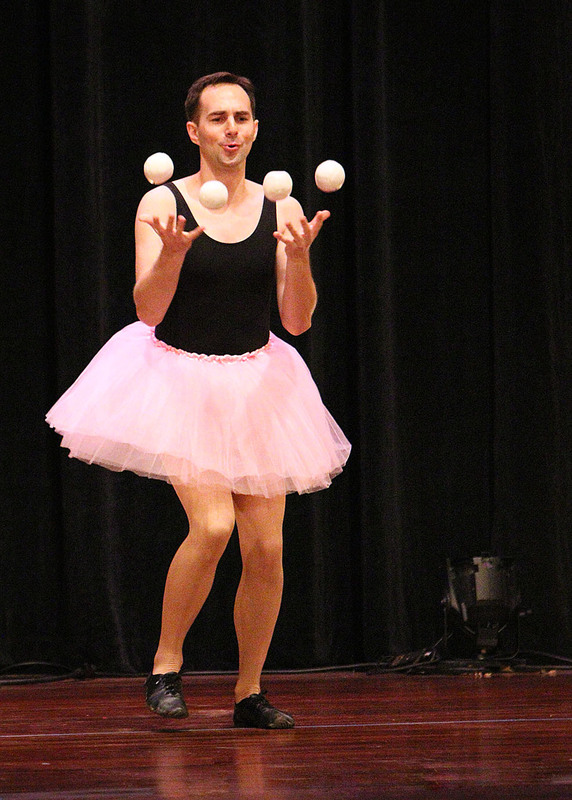 Wes Peden juggled with elbow bounces to a sustained song, going on to a seven-ball pattern. This routine is full of movement and showed Wes at his most flowing style. With all the complex tosses and unlikely catches it was noted the routine was dropless. 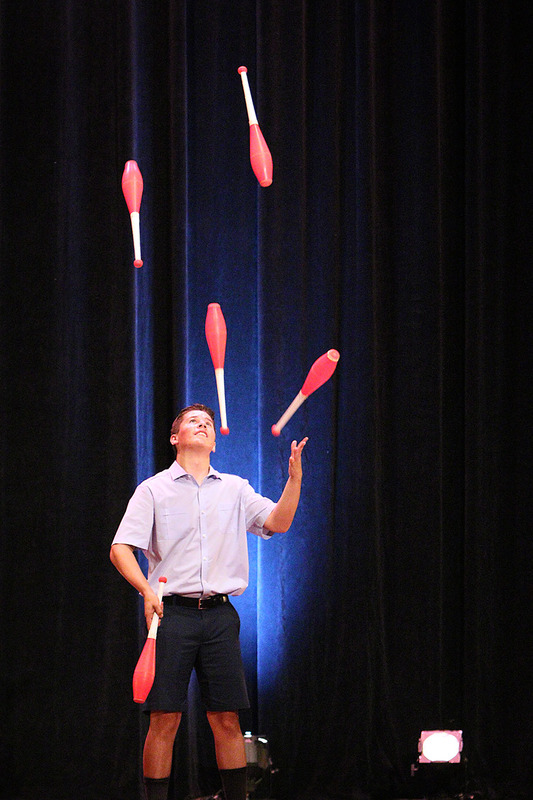 Wes also won first-place awards in the Individual Prop Contest for three-object routines and a gold medal in individual clubs in the Numbers Championship. In the X-Juggling competition, he won six plus balls, three clubs, five plus clubs, and three ring variations. 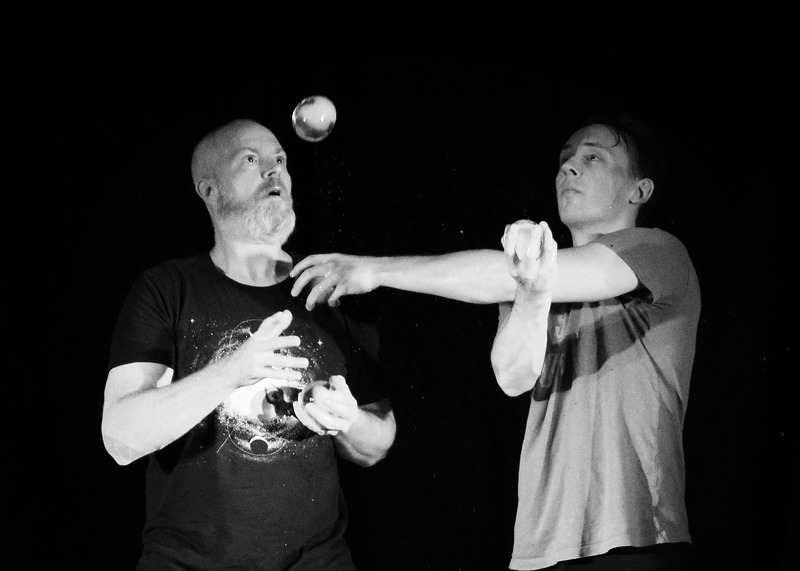 “Deluge sans gravity” Remi Lasvenes performed two balls with one float-away in which the floating ball became part of the story. During the interlude the Flamingo Award was presented to Miranda Miller. She received a festival package to attend next year’s IJA Festival and show her continued work. She began as a Jughead in Minnesota and also competed in the Indy Prop Contest. From my perspective, I was glad to see more women entering this event. I enjoyed working on a routine with new music, Timeless, to the expanded time limit (now three minutes) and finished second to Wes Peden in the 3-club event. Often, this contest has inspired me to create longer routines based on the theme. Courtney Cormier performed a baton act about reaching for the healing of time and the failures and travels a million miles can bring. 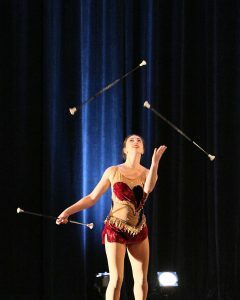 She spun and juggled two batons with body throws and nonstop energy. 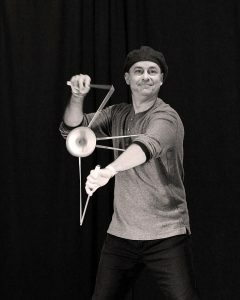 Performing with diabolo, Guillaume Karpowicz finds ways to isolate the movement to pauses and surprise moments for the audience. The music formed a series echoing the choreography. Michael Moschen performed a tap dance ball bounce excerpt from his show, making shapes with a three-ball bounce. Without recorded music the act was kept together by the integrity of the work. Known as the innovator of ball bouncing inside a triangle and crystal ball rolling, Moschen invented a myriad of shapes including the teardrop, S-curves, and mini hoops and sticks in isolation. 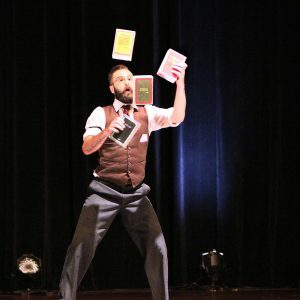 To learn more of Moschen and his technique: the TED Talk, Juggling as art… and science. Erik Aberg presented the Historical Achievement Award to Michael Moschen. Aberg’s eloquent intro did justice to Moschen’s originality and influence at a time the field was evolving theatrically. 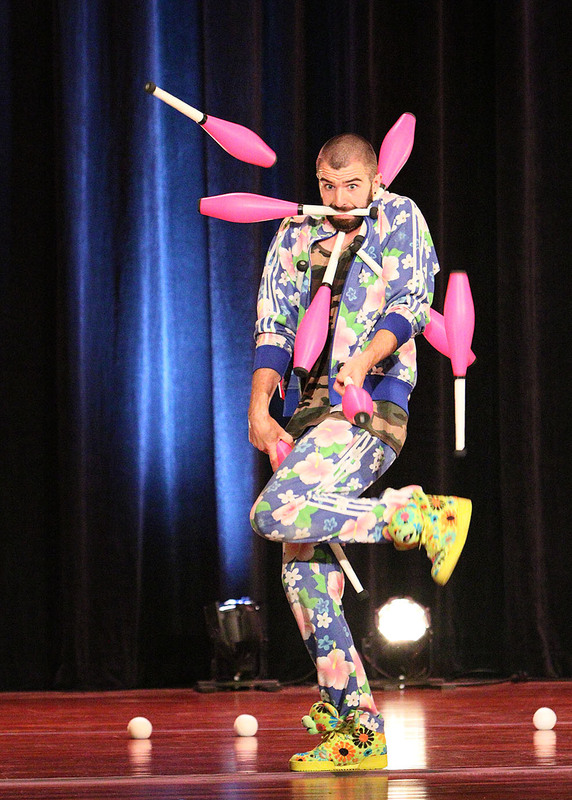 Moschen’s juggling collaborations began when he was a teenager teamed with Penn Jillette (of Penn & Teller). Moschen continued to perform with the Big Apple Circus, the Foolsfire trio (Berky, Garbo, and Moschen), PBS Special Great Performances, the Next Wave Festival at the Brooklyn Academy of Music. Moschen is also a recipient of the MacArthur Fellowship. He appears on the cover of the book, Juggling: The Past and Future, by Karl–Heinz Ziethan, published by Niels Duinker. Moschen shared his theory and practice with jugglers at the festival in a Creativity workshop. 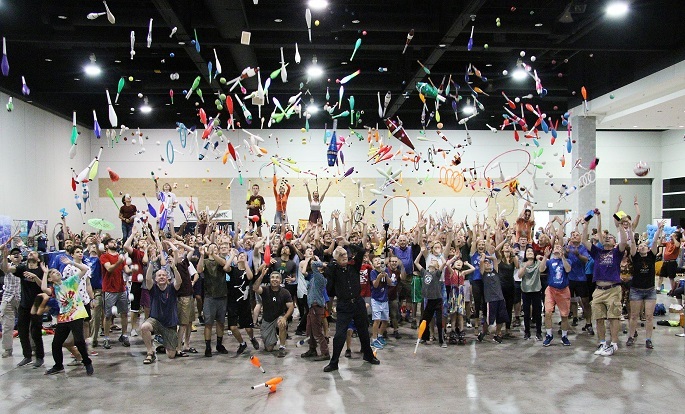 An entertaining Club Renegade brought the festival to a happy finish. Mark Faje balanced a lawn mower in a comedy sketch and was given a Renegade Ring award for his love of the art. Other crowd favorites like Bob Nickerson performed. On the first night, Renegade concluded with a disco themed dance. An X-Juggling contestant at the festival, Larry Vee attended his 12th IJA having started to progress in the art in the 1960s. The contingent of performers and hobbyists in the field has increased since, he said. He is organizing the Philly Fest in at Collingdale Borough Hall, PA, Oct. 5-7. 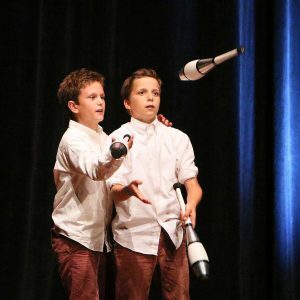 The creator of the X-Juggling event, Jack Kalvan, recently won The Gong Show with his family, known as Jack & Jeri, Max, and Oz. 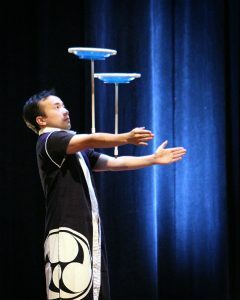 A version of their signature trick, the Three-person Juggling Statue, also won the X-Juggling event. 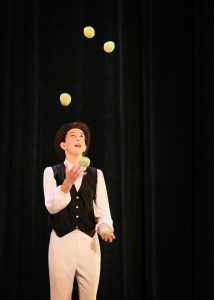 Jack Kalvan has written a new book on juggling, When Balls Collide, with co-author Arthur Lewbel..
Cindy Marvell began making her mark on New York ceilings at age twelve and has been juggling professionally since graduating from Oberlin College in 1988. 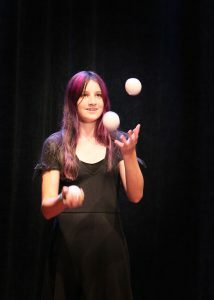 The following year she became the first woman ever to win the International Juggling Association's Championship. She has toured as a cast member with the Off Broadway show Lazer Vaudeville since 1994 including shows in Singapore, England, Saudi Arabia, Japan, Hong Kong, Taiwan, Alaska, and North America. Her solo work has taken her to Europe, Japan, and ex-Soviet Georgia. 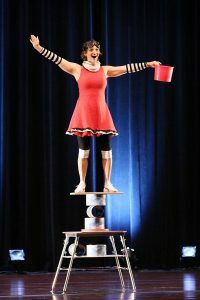 In the early 90s she joined San Francisco's Pickle Family Circus with director Larry Pisoni, performing at the Palace of Fine Arts, the Guthrie Theater, and Cincinnati Playhouse-in-the-Park. She studied dance at the Limon Institute and the Isadora Duncan Foundation, performing with Howard Fireheart's dance theater company in the East Village. New York shows include Bouncing Back at the Dance Theater Workshop, Ladyfingers at Lincoln Center Out-of-Doors, Young People's Concerts at Avery Fisher Hall, Sesame Street and the N.Y. Renaissance Festival. She has won two Groundhog Awards (the first solo woman) and a team silver medal at the IJA with the trio Darn, Good and Funny. 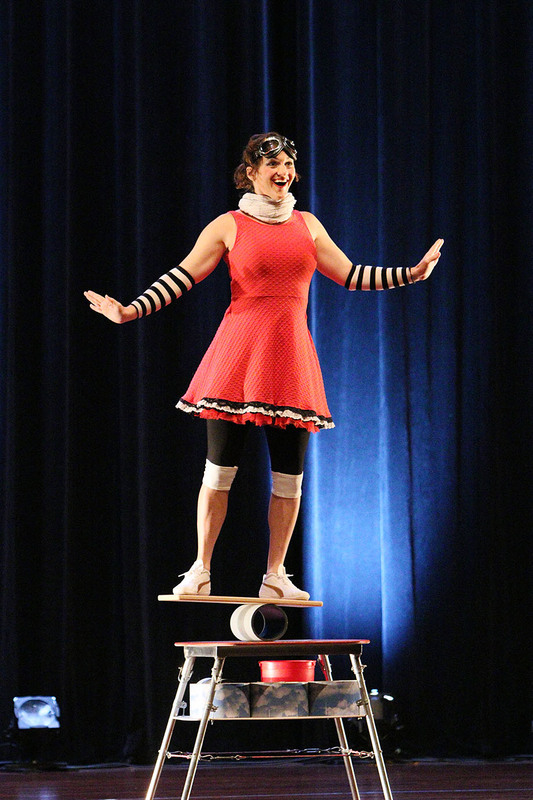 She is co-founder of the Boulder Circus Center and has also taught at the Big Apple Circus School. 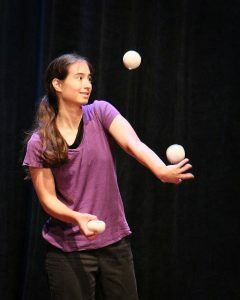 DVDs include A Juggling Journey (I & II), Trailblazers: Women Who Juggle, Lazer Vaudeville Off Broadway, and Juggling for Japan (available on amazon.com to benefit earthquake response). She has written a young adult novel, "Shadow Princess: An Indonesian Story" with co-author and puppeteer Tamara Fielding. 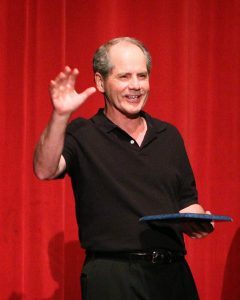 The book, a performance adventure story, is available on amazon.com and the Barnes & Noble website. 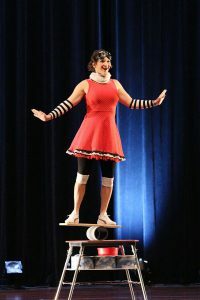 Last August, she performed at the Edinburgh Festival Fringe in Scotland with Freedom Family Circus and was featured in David Michelak's Slow Dance. 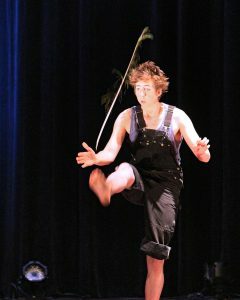 She has a son, Theo, with hoop juggler Carter Brown.